Bathurst, 1996. Charles Sturt University. A small group of theatre students put together a lively and well received circus show as part of the Bathurst 1000 car race, and the company Circus Monoxide was born! Within a year the group took ownership of a bus, painted it in their now iconic black and yellow stripes and began a tour of NSW. This tour continued on until 2001 and during those 5 years Circus Monoxide performed their outdoor show along pretty-well the entire Eastern Seaboard of Australia, from Kuranda in far north Queensland, to Apollo Bay on the southern coast of Victoria, out in Bourke and Lightning Ridge, and in the centre of major cities, with appearances in all sorts of festivals and other events. Not only did they travel, but the company grew in size, both adding more vehicles and a lot more performers. Many of which have gone on to some extra-ordinary careers in circus and the performing arts. Eventually Circus Monoxide put their roots down in Wollongong, a short drive south of Sydney, where they are now an integral part of the local community, teaching circus skills in their own concrete circus space. 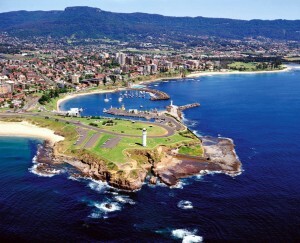 If you haven’t ever been to Wollongong, it’s a gorgeous seaside city at the base of a breathtaking mountain (mountain bikers and off road unicycle heaven!). What started from a small bunch of theatre graduates, eventually developed into a movement that inspired and informed a whole generation of new circus artists. One of the first contemporary circus shows I remember watching as an adult was a Circus Monoxide show, in a park in a Sydney suburb EDIT: in fact, as I just read this post out to Free, she recalled seeing Circus Monoxide in 1998 at a music festival in Kuranda. Seeing this show was instrumental in inspiring my circus journey (both Free’s and mine it seems!). Circus Monoxide continues to inspire a whole new generation of circus performers via their classes and teaching work. In early July Circus Training Australia is holding our first round of courses outside of Melbourne – in the Circus Monoxide training space no less – and we would love to have as many circus coaches come and join us to expand their teaching knowledge and inspire their practice. Put the dates in your calendar! Our first full day workshop on Monday July 6th (Teaching Circus For Kids) is perfect for new coaches. So if you have a student or assistant coach that you would like to give an extra boost towards becoming a fully fledged circus teacher, this is the perfect session for them. As well as Circus For Kids we will be running courses in teaching tumbling, aerial hoop, tissu (aerial silks) and of course trapeze. I am completely inspired about making a difference for circus coaches in Australia. I really believe in what we have to offer, and I would love it if you could also help out by spreading the word. Have a look at the timetable for our Wollongong workshops and find out more about Circus Monoxide, and I hope to see you all there!